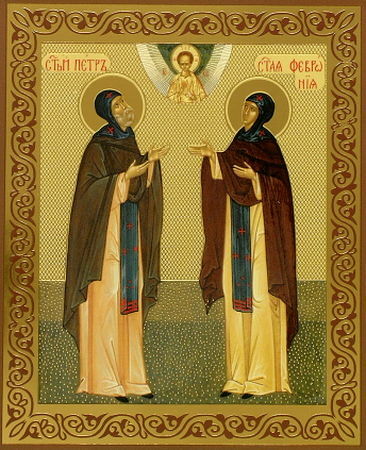 Holy Prince Peter (David in monasticism) and Holy Princess Febronia (Euphrosyne in monasticism), Wonderworkers of Murom. Prince Peter was the second son of the Murom prince Yuri Vladimirovich. He entered upon the throne of Murom in the year 1203. Several years before this Saint Peter had fallen ill with leprosy, from which no one was able to heal him. In a vision it was revealed to the prince that the daughter of a bee-keeper would be able to heal him: the pious maiden Febronia, a peasant of Laskova village in Ryazan gubernia. Saint Peter sent his emissaries to this village. When the prince saw Saint Febronia, he fell in love with her because of her piety, wisdom and virtue, and vowed to marry her after being healed. Saint Febronia healed the prince and became his wife. The holy couple loved each other through all their ordeals. The haughty boyars did not wish to have a princess of common origin, and they urged that the prince leave her. Saint Peter refused, and so they banished the couple. They sailed off on a boat from their native city along the River Oka, and Saint Febronia continued to console Saint Peter. Soon the wrath of God fell upon the city of Murom, and the people begged the prince return together with Saint Febronia. The holy couple was famous for their piety and charity. They died on the same day and hour, June 25, 1228, having received the monastic tonsure with the names David and Evphrosyne. The bodies of the saints were put in the same grave. Sts Peter and Febronia showed themselves exemplary models of Christian marriage, and are considered as the patron saints of newly-weds.